Lumen is intended as a poetic exploration of light in relation to the microscopic study of cells. Cells are the self-contained structures that constitute the basis of all life forms, but it is the way in which they have been visualised not their physiological function that informs this work. Microscopy provides a magnification of sight and an intensification of light that allows us to view what has previously lain invisible. This effectively creates images that are reliant on host specimens which paradoxically they do not resemble. Similarly in Lumen there appears a disparity between the image that unfolds on the gallery wall, and the small glass component that acts as its host. The intricately detailed cell-like image dominates over the clear-glass plate from which it emanates; their connection only made apparent by their matched incremental rotation. The kinetic image is produced by directing a small, but intensely bright light source at the glass while it turns on a platform. This allows real-time scans of the previously invisible interior of the glass to be projected onto the gallery wall. Lumen appears both mechanical and organic and speaks of a vision that is only attainable through the mediation of technology. It immerses the viewer in a space where light no longer only illuminates surfaces, but also defines volumes without mass. The title of the installation is a play on the double meaning of the term lumen, as a unit of luminous flux, and alternatively, the central cavity of a tubular or other hollow structure in an organism or cell. Lumen was initiated while Sellars was 'Artist In Residence' at the Pilchuck Glass School, Seattle, USA. Sellars then developed the work with the assistance of the Laser Physics Centre, Research School of Physics and Engineering, Australian National University. Craig MacLeod (technician/mechanical engineer) assisted with fabrication and Dr Matthew J. Sellars (quantum physicist) was the advising scientist. 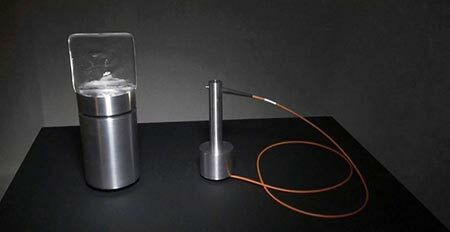 Lumen: machined aluminium, electrical components, glass, plasma arc light, fibre optics.